BUFFALO, N.Y. — Luke Kutkevicius and Mathew MacDougall scored in a shootout to help the Windsor Spitfires survive a North Bay Battalion rally and post a 4-3 victory in Ontario Hockey League exhibition action Saturday. Aaron Luchuk, Kirill Kozhevnikov and MacDougall scored earlier for the Spitfires, who won the Memorial Cup championship as the host team last May. 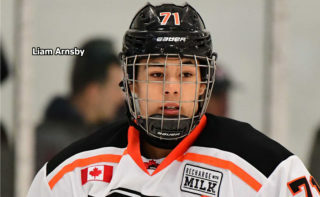 Goaltender Michael DiPietro, who was key to the Cup title, faced 24 shots through 60 minutes of OHL Pre-Season Showcase action at HarborCenter. Luke Burghardt, shorthanded, Brad Chenier and Justin Brazeau scored in regulation time for the Battalion, which trailed 3-0 before mounting a comeback. Goaltender Julian Sime made 38 saves through three periods for the Troops, who downed the Kitchener Rangers 4-3 via shootout in their Showcase opener Friday. 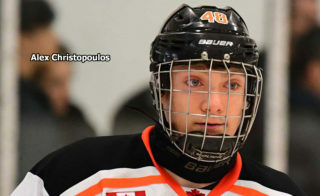 Sime denied Luchuk before Kutkevicius and MacDougall scored in the shootout, which immediately followed regulation time, as is the OHL preseason protocol. DiPietro foiled a Burghardt effort and Brady Lyle connected on a deke before DiPietro ended the game with a save against Daniil Vertiy. Brazeau tied it 3-3 with his second goal of the Showcase at 11:21 of the third period, taking a diagonal pass from Payton Vescio and one-timing the puck through traffic from the inner edge of the left faceoff circle. Jesse Saban had the other assist. MacDougall gave Windsor a 3-0 lead at 9:06 of the second period, knocking the puck home after it deflected through traffic off a right-point shot, before penalty killer Burghardt sparked the Battalion when he seized a loose puck in the offensive zone and raced in alone on DiPietro, outwaiting the goaltender in a right-to-left cut across the goalmouth and lofting the disc into the net at the 16-minute mark. Chenier scored at 18:50, corraling a puck that would have exited the zone up the right-wing boards and quickly lobbing it to the net, where it eluded the heavily screened DiPietro. Windsor, which defeated the Flint Firebirds 4-3 Friday, had the Troops on their heels early and took advantage when Luchuk scored unassisted at 3:54 of the first period. The Battalion killed a spurious interference call against Saban issued at 12:15, with Sime making a good right-pad stop against Jake Smith and, just after Saban returned, denying Austin McEneny on a drive up the slot. 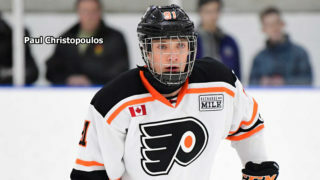 Kozhevnikov connected at 15:19, converting a rebound at the left edge of the crease on assists by Luke Boka and Kutkevicius. Assistant coaches Scott Wray and Adam Dennis again ran the Battalion bench while head coach Stan Butler observed from the stands. The Battalion completes its schedule in the six-team Showcase when it faces Flint at 12:30 p.m. Sunday. BATTALION BULLETS: Opening lines included Adam McMaster centring left winger Luke Moncada and right winger Brandon Coe, Kurtis Evans centring Brett McKenzie on left wing and right winger Brazeau and Burghardt centring left winger Chenier and right winger Alex Robert. 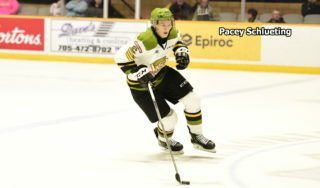 Rhys Forhan centred left winger Vertiy and right winger Patrick Brown … Defence pairings were Saban with Vescio, Eric Allair with Travis Mailhot and Simon Rose with Lyle … Burghardt made his Battalion debut after being acquired with Moncada in a trade from the Guelph Storm on June 27. 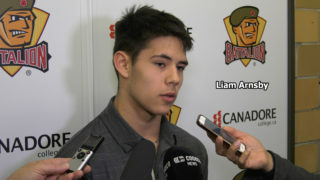 Apart from Burghardt, skaters who saw their first Showcase action were Chenier, Robert and Saban … Mat Woroniuk, who backstopped the win over Kitchener, backed up Sime … The Battalion scratched Cam Dineen, Daniel Walker, Kyle Potts and Andy Baker, all of whom played in the first game. 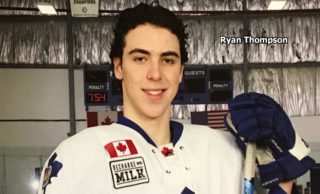 Jacob Ball and captain Riley Bruce, who are recovering from injuries suffered last season, and Adam Thilander, with Sweden’s national junior team, aren’t in attendance … McKenzie wore the captain’s ‘C’ with Brazeau and Saban serving as alternates … Among those missing from the Windsor lineup were Gabriel Vilardi and Logan Brown … Each team went 0-for-4 on the power play … The referees were Joe Celestin and Ryan Harrison.